This article describes how to install and use the AWeber Shopify integration build by Combidesk. 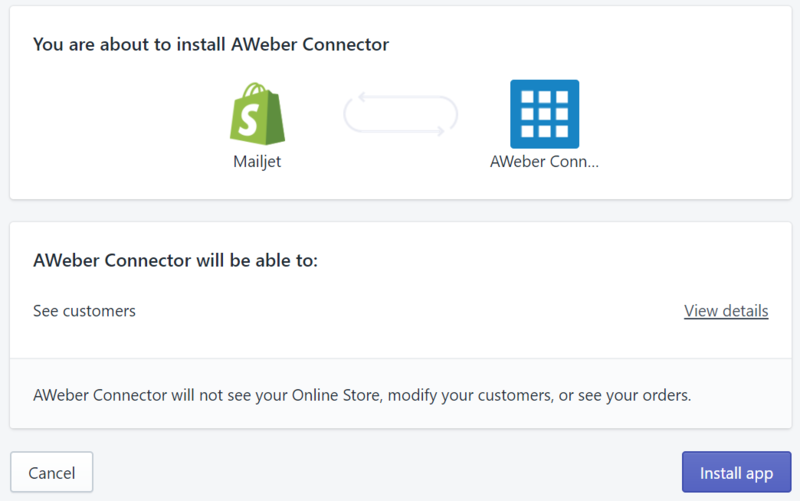 In order to connect your AWeber account to your Shopify store you need to create a AWeber account first (create account here). Already using AWeber? Great! Continue step 2. Visit the AWeber app in the Shopify app store here and click on the green GET button. You may already have customers and subscribers and want to export them to AWeber. Use this step to export existing data. Also, you can put in a request to have your subscribers bypass the confirmation step if they are being added through our API. Please feel free to contact AWeber with these requests. PLEASE NOTE: make sure your confirmation message is turned off for the list you're importing your contacts in! The steps for this tutorial differ depending on whether you are using a sectioned or a non-sectioned theme. To figure out whether your theme supports sections, go to the theme's Edit HTML/CSS page. If there are files in the Sections directory, you are using a sectioned theme. Non-sectioned themes were released before October 2016, and do not have files in the Sections directory. 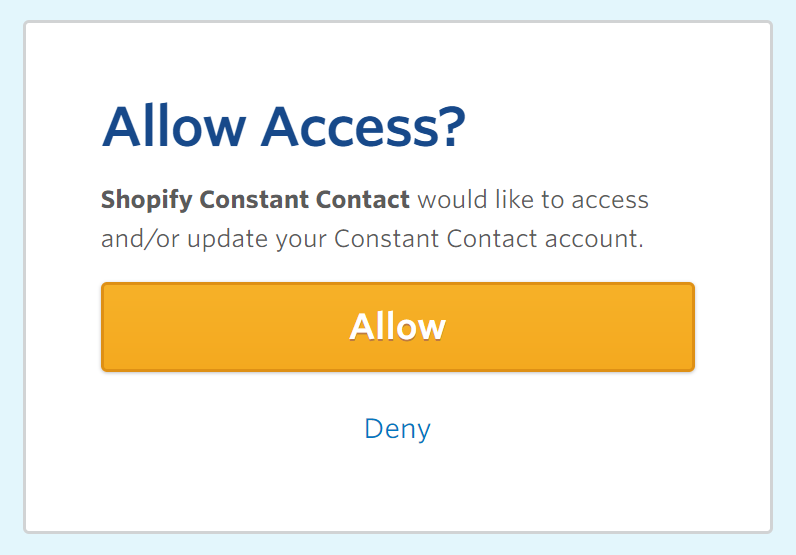 If you are using a sectioned theme, new contact who subscribed through your section signup form will automatically add to your Shopify customer section. If you are using non-sectioned theme, then you can use this URL as a custom Form Action URL in case your Shopify theme only supports Mailchimp integration (Non-sectioned theme). 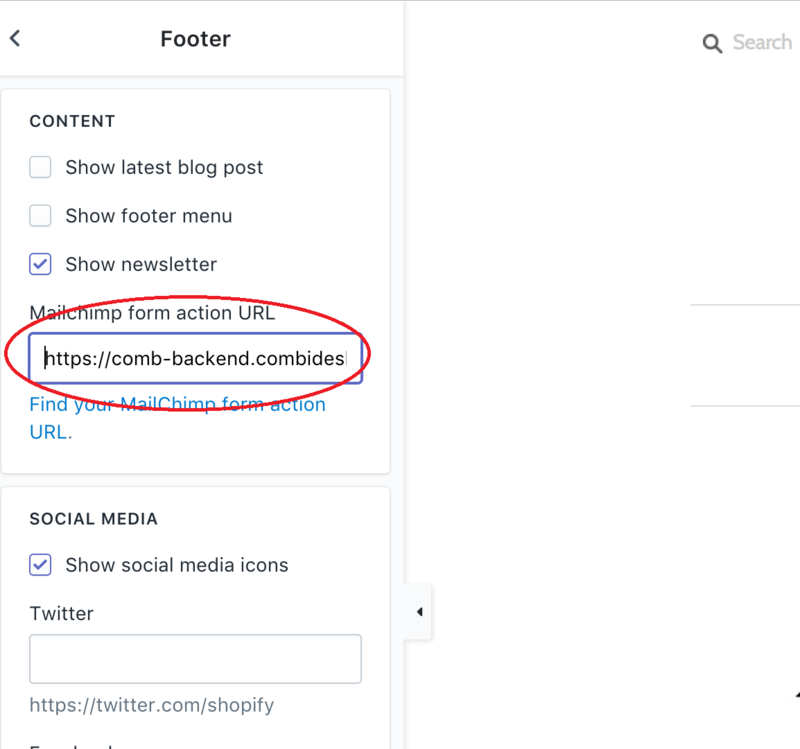 You can paste this URL in Shopify in the Mailchimp form action URL field when editing your theme's footer. C) Connect you AWeber account. Click the orange button to connect your AWeber account. Fill in your AWeber credentials (email + password) and login. When you're already logged in you'll see this autorisation screen. Hit 'Allow' and you'll go back to the contfiguration page. When you already use lists in AWeber you can select a mailing list for subscribers and customers. No lists yet? Just create one for subscribers and/or customers, refresh the dropdown list in this step and it will appear new in the dropdown list. Do I need to pay for AWeber? You can contact AWeber support here to have it disabled for you. Can I use the Abandoned Cart feature? In order to use our Abandoned Cart feature you need to let AWeber disable the optin function. You can contact AWeber support here to have it disabled for you. How do I use Signup Forms? This signup form has the same look and feel as your Shopify website. Easy to use, easy to install. PLEASE NOTE: The steps for this tutorial differ depending on whether you are using a sectioned or a non-sectioned theme. To figure out whether your theme supports sections, go to the theme's Edit HTML/CSS page. If there are files in the Sections directory, you are using a sectioned theme. Non-sectioned themes were released before October 2016, and do not have files in the Sections directory. If you are using a sectioned theme, then click the Sectioned themes button and follow the instructions. If you are using non-sectioned theme, then click the Non-sectioned themes button and follow the instructions. When you're using a non-sectioned theme, please use the Combidesk AWeber subscription URL we're providing during the app installation flow. You can paste this URL into the MailChimp subscription URL and the connector wil sync subscribers to your selected AWeber list. If you are familiar with HTML, you can add a Custom HTML section to your store's home page. Custom HTML lets you create content without having to follow the formats used in other section types. Adding an opt in form to pages on your website is a great way to improve your newsletter or autoresponder campaign. Follow these 2 steps in order to add a custom HTML section on your Shopify store. First create an AWeber form, copy the custom HTML code, create a HTML section in Shopify and paste the AWeber code in this section.